Aside from it’s stupid title, 42 is still an enjoyable film that keeps your attention and interest. This is a pretty good baseball movie about the idea to put an african american in the game, and all of the backlash and scrutiny that goes with that. 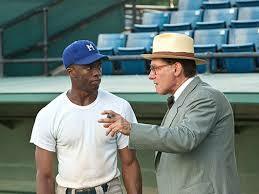 harrison ford plays branch rickey, the man who has the idea, and he’s fantastic in the role. he basically sells this thing, not only to the other team executives and to jackie robinson, but also to us, the audience. robinson, as played by newcomer chadwick boseman, is also pretty great. the movie deals with everything he had to go through, including lots of self-control and holding back on his anger. robinson has to be a player who is tough enough to endure and stand up to the pressure, but also in contol enough to not fight when he is pushed to do so. there’s plenty of conflict in the movie and it’s a very well-made film. luckily the movie is about the situation and the players more than it is about the sport of baseball. robinson steals bases at free will, and has fun with the experience, treating it as a sort of adventure. 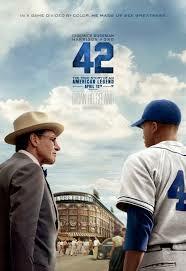 42 is the story of Jackie Robinson. Now we’ve all heard the story, over and over again, about how he was the first black man in baseball, or really in any pro sport. And we know about the kind of racism he must have faced. But this is really the first mainstream movie to tell his tale. It took Brian Helgeland as a director and Harrison Ford as a costar to get it done, and it’s a pretty solid film that does just about everything right. The movie starts out with Branch Rrickey, the Harrison Ford character, who is the head executive of his team, the Brooklyn Dodgers. Rickey has the idea to put an African American in the game. He wants to do something radical that will turn heads, and he knows this is the move that will get attention. at the same time, we wants to put the best players on his team that he can find, and if this Robinson is better than other players on the team, then Rickey really doesn’t care what color his skin is. We get some fun debate scenes between Rickey and the other executives who work for the team and serve under him. They try to argue with him and tell him that he can’t do this, and he explains to them his logic. he also comes off as a character who doesn’t really care what other people think and who just wants to do what he believes in. it’s a pretty good first scene of the movie, setting up the situation and putting us in the right direction. from there, we meet jackie robinson. he’s played by chadwick boseman, an actor who is pretty new to the mainstream, but seems like we will be seeing much more of him in the future. boseman is good in the title role. he handles both the anger and the self control that his character will need to endure throughout the film. when we meet him for the first time, he’s at a gar station with his team, and is being refused access to the bathroom because of his skin color. robinson tells the gas attendant to take the hose out of their bus and that they’ll get their gas elsewhere. that’s when rickey’s men come up and make him a proposal. i like that the movie switches back in it’s first scenes, between robinson on the road, and ricket sitting in his office. we get that opening scene of rickey coming up with the idea, but then we get another one at the start of the film, where rickey looks through files and discusses all different african american players who can be candidates for what he wants to do. he chooses robinson for a number of reasons, but one of the main ones seems to be that the guy has a temper. he’s not going to be a pushover who will buckle under the pressure. the temper issue happens to be a very big part of this film. that’s because rickey doesn’t want a guy who is going to explode and fight with the first player who calls him a name, or the first pithcer who throws the ball at his head. he knows that if robinson fights, then the media will blame him entirely. they’ll say it was a mistake to put a black man in the game. but at the same time, rickey wants a guy who will endure and handle the pressure, and not lay down and give up. robinson starts out his career with the minor league team that is affiliated with the dodgers, and pretty soon he makes it into the big leagues. that’s where all kinds of chaos breaks loose. for one thing, robinson steals bases. that’s his thing. he takes huge leads off the base he’s at, as if he is daring the pitcher to try to get him out. now, considering lots of these pitchers already have a problem with him because of his skin color, the taking huge leads and stealing so many bases ends up really getting on these pitchers’ nerves. it also makes for a lot of fun scenes. then there are the scenes between robinson and his teammates. some of them work, some don’t. and with them, we get a little bit of everything. there’s the story of the team manager, who had no problems with robinson and said he just wanted the best man for the job. that manager ends up getting laid off because of a scandal he’s involved in. then there’s the story about how robinson waits until all of his teammates are done showering before he hits the showers himself. but none of these stories are all that interesting. the one that is interesting, however, is the plotline about a petition that a number of his teammates sign, which says they refuse to play on the same team as him. the petition makes it to the attention of rickey who is not up for negotiating at all. he convinces the men that this is in no way their choice, and when one of them just can’t come to terms with it, that player gets traded away to another team. there’s a lot going on in this movie, with tons of subplots. not all of them work, but some certainly do. jackie robinson’s wife isn’t given enough screentime or personality to really make a difference, and neither is the writer who hangs around him. but one scene that really does stay with us comes in the second half of the film as the manager of a rival baseball team, ben chapman (played by alan tudyk), decides to spend the entire game taunting robinson. the way robinson handles it and controls his anger, at least long enough to get off the field, is pretty great. 42 is a pretty well-made movie. it sometimes lingers on a little or delves into areas that aren’t exactly riveting, but for the most of the film we are interested and hooked and ready to see more.